A simple, inexpensive way to enjoy your herbs beyond the growing season is to dry them! When talking about herbs, we’re referring to the leaves of certain plants that are usually green in color. Spices, on the other hand, are the flowers, fruit, seeds, bark and roots of tropical plants and are typically more pungent than herbs. While the best flavors come from freshly picked herbs, however there is always an abundance that you cannot use in one season. Drying your herbs is the next best thing! Dried herbs can be used for anything from flavoring recipes to making a fragrant fire starter. 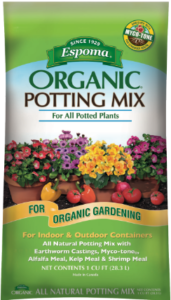 We recommend growing organic herbs in Espoma Organic’s Potting Mix. To get the most flavor from herbs you need to harvest them at just the right time. The fullest flavor comes from herbs harvested before they flower. If you use a lot of freshly picked herbs, they may never flower. If that is the case, and you want to savor that flavor during the non-growing months, be sure to harvest them by the end of summer before the weather cools to get the most flavor out of them. Focus on one type of herb at a time and remember to only cut back what you need. Try to avoid cutting back the entire plant, unless you are ready to replace it. Cut healthy branches from your herb plant. Discard any damaged leaves as they have already lost their flavor. Yellowed leaves aren’t worth saving. Gently shake the cut branches to remove insects and excess soil as you won’t be washing the stems. Remove the bottom inch of the stem and the lower leaves to allow room for tying. Place the leaves aside – you can add them to the bag on their own. Tie 5 or 6 stems together with either string or a rubber band. Make sure to check in on them as they dry as herbs shrink down and may slip out of the band. Place herbs in a paper bag, stem side up. Tie the end of the bag closed, being sure not to squish herbs. Hang the bag by the top in a warm, well ventilated room. Once your herbs are dry enough to crumble, they are ready to be stored. Keep dried herbs in an air tight container, like a small canning jar or a zippered bag. There you have it: freshly dried herbs to enjoy all year long! Learn what to plant next with Laura from Garden Answer.